Sanquhar lies in the valley of the River Nith, one of the main routes from central to southern Scotland through much of history. 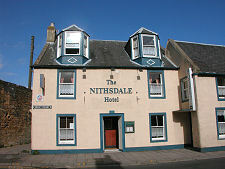 Today, Nithsdale is followed by the A76 from Dumfries to Kilmarnock and Ayr. Today's Sanquhar has an unusual feel. 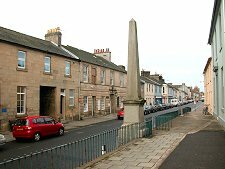 Not quite an agricultural market town, nor a typical rural industrial centre of the sort quite common in Ayrshire. Instead it is a little of both. 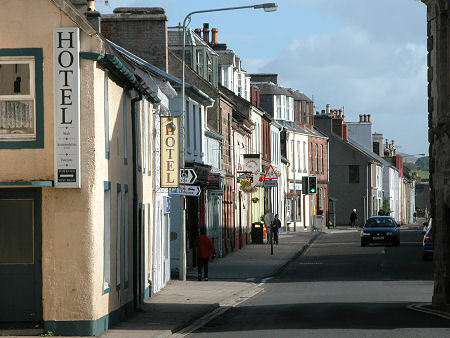 The High Street carrying the A76 through Sanquhar is fairly broad in places yet also seems enclosed by the two storey buildings that line it on both sides. At its north west end it squeezes past the side of the imposing tolbooth, built in the 1730s at the expense of the 3rd Duke of Queensberry. 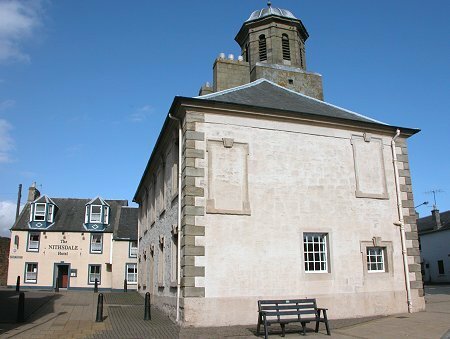 Today the upper floor of the tolbooth is home to a fascinating town museum. 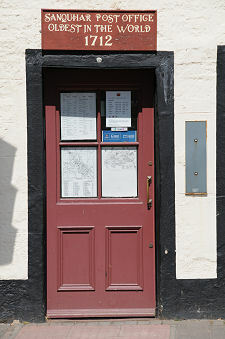 Part of the ground floor, accessed by the interesting passage right through the building from front to back, has been used to recreate one of the tolbooth's original uses, as town jail. Still attached to the outer wall of the tolbooth is the large iron staple and ring, known as the joggs or jougs to which miscreants were attached by an iron collar: for the scorn, derision and rotten eggs of passing townsfolk. This arrangement was last used in 1820, for a housebreaker so short he had to stand on a large stone so the ring on his collar could be locked to that on the staple. Here he spent two hours a day for the next three days, one of which was, unfortunately for him, a market day. 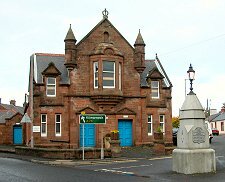 Just north of the tolbooth the main road passes the Town Hall, built in red sandstone in 1882. In front of it is the fountain commissioned for Queen Victoria's diamond jubilee. 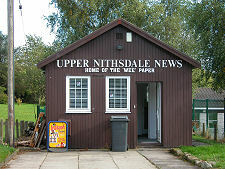 Rather older, is Sanquhar post office. This has been operating continuously since 1712, making it, as the sign above the door proclaims, the oldest in the world. A less immediately obvious attraction to Sanquhar is the superb Blackaddie Country House Hotel, beside the River Nith on the north west side of the town. Elsewhere in Sanquhar you see signs, literally, of the Town Heritage Trail. Look out for the plaques highlighting points of interest, like the passage that once led to the site of the gallows; or the close in which, in 1812, two French officers, both prisoners of war quartered here, fought a duel over the affections of a local girl. 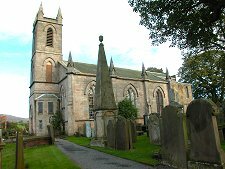 The loser was a Lt. Arnaud, and his grave can be found in Sanquhar kirkyard. 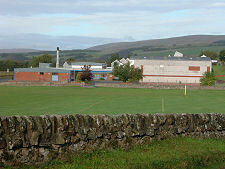 Traditionally, Sanquhar made its wealth through its weaving and handknitting industries, the latter producing a range of patterns unique to the town. In later years it also benefitted from the exploitation of local coal reserves. The handknitting industry still survives in Sanquhar, but the coal is long gone and with it went some of the town's earlier prosperity. There are a number of signs of this. 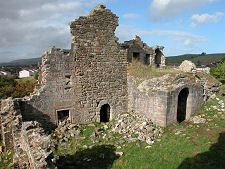 Most poignant is the derelict and neglected Sanquhar Castle on the southern edge of the town: virtually the first thing you see in Sanquhar if approaching along the Southern Upland Way, the 212 mile long distance footpath from Portpatrick to Cockburnspath, which passes right by the castle en route into the town.